Mid September saw me fulfil an ambition to find out what they do at ELK. I always thought it was Elk and couldn’t think what this had in common with cacti. Of course you all know it stands for Europäische Länderkonferenz, (European Countries Conference), which is why they call it ELK. Strangely the conference is free, as is entrance to the plant and sundries sales. You only pay for the accommodation and food and can make your own arrangements, some save Euros for plants by camping. I understand that most people go to buy plants and there is a fantastic array on sale; new species, rare species, instant show winners, irresistible bargains and the opposite. I started at 1am, yes just after midnight, to catch the dawn ferry with Ian to Dunkirk. Do not think that the ELK experience is easy. On our arrival at Blankenberge in Belgium we had a few hours to wait for the sales to open, a chance to have lunch and meet up with fellow British ELKers. Funny how they are the same people who I meet at all the major BCSS events. Then the sales areas were open and the fun began. 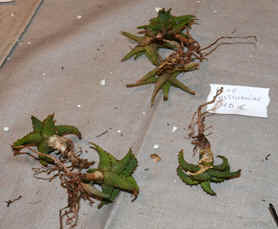 There were three separate sales areas with around 120 growers from all over Europe, as well as nurseries from Japan and Réunion, the little island near Madagascar. I did not really want to buy plants, my greenhouses are full, but there were so many interesting species at very reasonable prices I naturally had my head in the trough. So what did I buy? Well, why buy one Faucaria tigrina when I could have 31 seedlings, prick them out, and have some spares. (They made two panfuls so this didn’t help with the crowding.) I did buy a single big Faucaria tuberculosa just like the one I killed a few years back. Likewise several Lithops species; the seedlings did not look very ‘pure’ but I am getting less fussy these days and just pick out the pretty ones for myself. And the spare dorotheae will always make attractive stoneplants for the public. I declined approximately 200 flowering size Lophophora diffusa var. kohresii in a large seed tray at just over £1 each. It’s the space you know! Among newly described novelties on sale I bought Aloe castilloniae from Mr Castillon and named after his mother. This is (hopefully) a small growing species from southern Madagascar. I also looked with interest at Peperomia mayeri, the first plants I have seen of this species. Apparently so new to cultivation I couldn’t find any info on the internet until I realised the label read P. maijeri .This was described in 2012. I was doubtful about its hardiness; The label reads San Marcos, Peru so it might possibly be OK.
At his stall John Pilbeam showed me Pachyphytum cuicatecana, a ‘new’ species which looks like P. oviferum but must be different because it has a different name. 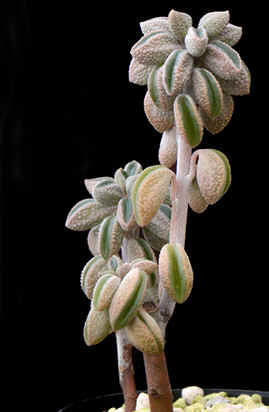 What’s more it was described as Echeveria cuicatecana in the Mexican journal where it was compared to Echeveria laui. Confusing? With so many growers present it was interesting to compare the growing methods. 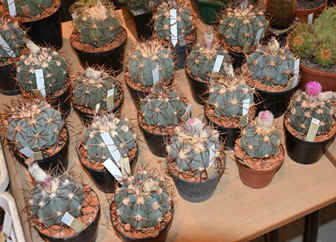 I saw Ariocarpus growing vigorously in pure coir, a most unlikely medium for success. (Coir is the hair of coconuts and makes a compost with the general look of fibrous peat. It is also used to make door mats) I actually bought plants growing in the opposite, a totally mineral compost of grit-sand, grit and chippings and they looked equally healthy. I sometime wonder if we fuss too much. 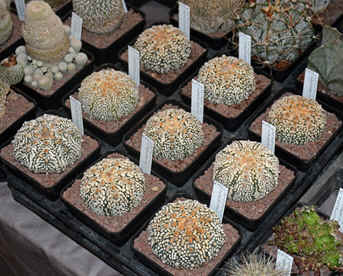 With so many rare and slow growing plants for sale a fair proportion of them were grafted. Curious were Ariocarpus ‘Godzilla’, on the Kobayashi stall, one of those bizarre knobbly forms, grafted on a one foot stick of some chunky cereus. I would personally be embarrassed to have one in my greenhouses. And, I suspect, embarrassed financially if I bought one from ELK. 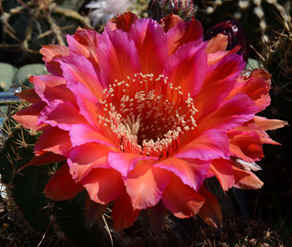 One grower had many grapefruit-size flowering Echinocactus horizonthalonius bursting with health. Grafted, I asked. Non! Errrrm? The most desirable plant I saw was a clustering Aztekium ritteri. It was beautiful and would be an instant show winner. I have to say that the €700 (£580) price tag was the only drawback to my buying it. I could definitely find room. But was it also grafted? Curiously a few other sorts of plants crept in; an interesting bare-root caudiciform turned out to be Allium ampeloprasum, which most of us would call ‘elephant garlic’. There were a selection of bearded irises for the garden and I fulfilled an ambition to have the new Hosta ‘Blue Mouse Ears’, much cheaper here than the UK flower shows. Over the weekend there were interesting presentations in varied languages. Three in English, the universal language, and I understood much of the French presentation. Luckily it was on a part of Argentina I have visited so recognising the plants and places helped as well. Did you think that we all said the specific names the same way? 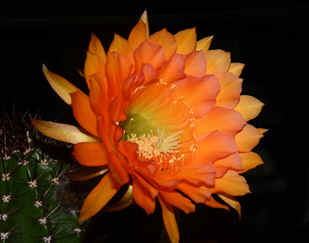 Unfortunately the talk on Peruvian cereus was in Dutch, but the pictures were interesting. 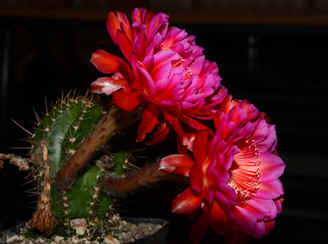 Above: A trio of pretty Echinopsis hybrids say “buy me, buy me” but I resisted. With all the buying, talking, listening, eating and drinking it was pretty exhausting. Then there was the regular Sunday grind along the M25. I got home at 10pm that night, worn out but I thought well worth the effort. And those plants will remind me of the ELK experience.